Simple steps to see if you are wasting water. One of the most common calls our team receives is the complaint of a high water bill. Has your water bill gone up recently? Maybe your water bill has gone up slowly over time, and you didn’t think much of it until you realized over the last year it has gone up several dollars every month? We don’t often think about a $5.00 increase in our water usage, over time though that money adds up, and so can the damage if this increased water usage is due to a problem. Perhaps you’re one of those people who just received a surprise water bill that is double, triple or more what your normal water bill is. A professional record for me on a high water bill……take a guess. $1800.00! Can you imagine? Yes, we had a client call that the City of Phoenix came out to alert them that they must have a major issue because the water bill had just triggered a home visit. 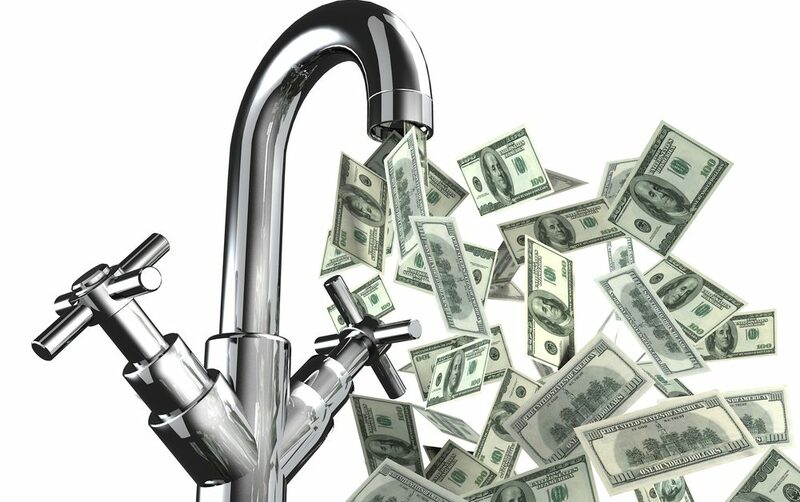 Whether your water bill is up $10.00 or up, even more, it is often a sign that there is a problem and you are wasting water. Often the wasted water usage is something incredibly simple that you can address on your own so let’s cover some simple steps to help you save water, save money and save your peace of mind. Step 1 – Check your meter for movement. Your water meter is typically located at the front of your home near the sidewalk; this doesn’t account for condominium complexes or apartments. If you are not in a single-family dwelling, you may share a meter with your neighbor(s) and this step may not be possible for you. Your meter is typically covered with a rectangle metal box that has a small slit in it for you to be able to lift the cover. Be forewarned; there are likely some bugs under that metal lid so if you’re skittish of crickets and the like like I am, be prepared to jump backward and scream and try to make sure you’re neighbors aren’t watching. Beneath the lid, you’re going to see your water meter. There several different meters out there, some have either a gear or triangle within the face that will spin any time the water is being used. Another style a digital meter that will have a digital read out telling you how many gallons per minute are being used. If your meter is moving, it means you are using water. I know, how could you possibly be using water if you’re outside running from crickets? Meters don’t lie; if that meter is moving, you are using water. The next step is to determine if you are using water inside your house or outside. The next step is to shut the water off to your house at the valve, not the meter. Your home’s emergency shut off valve is usually located near the front of your home by your hose bibb, where you connect your garden hose. Beneath your hose bibb, there should be a valve that has either a lever handle or a circular handle. It is important to know where this shut off valve is regardless, in case of a leak inside your home. This is the valve you use to shut off the leak and stop your house from flooding. You will want to turn the valve handle to the right to close it. If the handle is a circular handle, twist gently. This style valve is called a gate valve, and if it hasn’t been maintained or used for a while the gate may drop, and you won’t be able to turn your water back on. If you have a gate valve style emergency shut off valve I highly recommend contacting our office today to have this valve changed out to the more modern and dependable ball valve style shut off valve. This valve is important, and you want to make sure it is in good working order. Once your valve is in the off position go back to your meter. Check to see if the meter is still moving. If the meter has stopped moving the water being used is inside your home, if the meter is still moving then the usage is before the valve, not after, indicating that the excessive usage is outside. If your meter is not moving it usually means one of two things. One – you’re household is using more water, and you likely have someone singing too long in the shower or something similar, and you will need to monitor your families water usage and go over the importance of water conservation – here is a blog on water saving tips. When my son was a teenager and went through this phase I would shut the valve off to the water heater after 15 minutes – then I would laugh and laugh and laugh! If you feel that your family is using the same amount of water as usual and you have a suspicious water bill you can be losing water elsewhere, but something that isn’t currently being used. The most common culprits of water usage are running toilets and irrigation leaks. If your meter stopped moving after you shut the water off to your home, you have water being used within your home without your permission. The audacity! 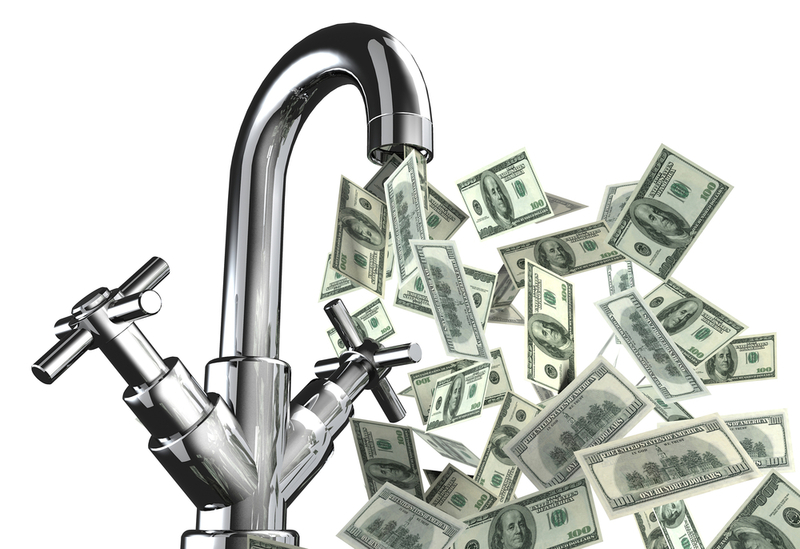 The next step to discovering the mystery of the high water bill is to turn the water back to your home so we can inside and visually check your plumbing system for the culprit(s). A visual inspection of the following list of items could lead you to discover where all of that missing water is going. Let’s begin. Don’t be intimidated; you’re only going to be looking and listening, you don’t need to be a plumbing expert for this next step. Check all of the faucets in your home. Check your kitchen faucet and all of your bathroom faucets. A leaking faucet can add up to hundreds of gallons a month; a leaking faucet can also corrode the faucet body forcing you to replace the faucet rather than repair it. If you see a faucet dripping it is time to call our team out to get that taken care of before a repair turns into a replacement. Too often we see a leaking faucet go on the honey-call-the-plumber list and gets put on the back burner, and then an entire replacement is necessary due to the erosion of the faucet body. Running toilets are also something to check; you can usually hear a toilet if it is running and if it is running, it is time to call Robins Plumbing to catch it. (No, I don’t get tired of silly jokes) Lift the lid on the back of your toilet, and if you can visually see water movement in the tank, it is time to replace the parts inside your tank. If it isn’t the parts inside the tank, it could be a hairline fracture in the porcelain as well. Leaking shower valves, like leaking faucets, can add up to gallons of lost water quickly and if not repaired can lead to replacing the entire housing. If your shower valve is leaking call us right away to fix it, seriously, dial 623-486-4857. Don’t let a simple repair turn into an entirely new shower valve unless you’ve been trying to talk your spouse into a new shower valve because you hate your old one…..then go ahead and wait. We’ve got you covered. Your shower valve is actually behind your wall which usually means tile repairs or drywall repairs as well as the replacement of the shower valve itself. If you’ve considered a bathroom remodel, and your shower valve needs to be replaced, this is a great time to pull the trigger on it. Hose bibbs out in your yard, or what some people refer to as garden faucets are another thing to check. If there is a hose connection leaking it will need to be replaced. Water filtration systems are another sneaky place that water can be wasting away. If you have a filtration system in your home, put your ear to it and listen to see if it is running. If you hear it working it is time to have it looked at. The same rule applies if you have a soft water system, put your ear to the system and listen to hear it is running. There are two times to hear running water. Once when the salt brine tank is filling (similar to a toilet filling) and when the flushing is happening. If your salt water system is running when it should be it is time to call us out for repairs. Pool fill valves are another sneaky place water can be going that you’re not aware of. You will need to isolate your pool shut off valve and check the meter again to see if the meter stops moving if the meter stopped it is time to call your pool company to have the pool system checked. If your toilet fill valve is leaking that will usually show up on the meter, but a phantom flush from a leaking flapper will only show up intermittently. Irrigation leaks are the most common reason for a hike in your water bill. Many clients in the Phoenix area have their irrigation on timers, and for a good reason, landscaping in Phoenix can die in a few days without water. Irrigation leaks go missed by homeowners all of the time because they don’t see the leak during the few minutes that the irrigation is running. To see if the extra usage of water is in your irrigation system you will need to turn your irrigation on and walk through your system to check for leaks. Step 4 – If you didn’t find the culprit and haven’t call us already! Step four is the simplest step if you haven’t called us already and still have a high water bill – you need to. Here let me make it is easy, 623-486-4657. I’ve shared with you all of the things that are visible that can cause a high water bill, but there are things that are not visible. Our team of professionals will go through your entire plumbing system to diagnose where the water is going and give you your best options for repair. A high water bill should never be ignored; it is usually a sign that something is wrong – a symptom of an underlying problem that left unchecked can lead to even bigger problems in the future.